Looking to sell your Reno Home? We're here to help you through every step of the process! Click here for a FREE Home Evaluation: A well-priced home will generate competing offers and drive up the final sale value. Our free market analysis takes into account the most actively searched prices and home values in the area and provides you with a detailed evaluation that puts it all in perspective. Avoid using a Reno Realtor that is unfamiliar with the area your property is located in. For example: Maybe you have a friend that is in the business, but he lives 150 miles for your home and is a member of a different real estate board. There is a good chance that he/she might not be familiar with the Reno Real Estate, Sparks Real Estate, or Tahoe Real Estate markets and advertising that works best here. Also, if someone would like to set up an appointment to see your home, the distance between your home and the listing agent might make the process difficult. Make sure that your Reno real estate agent is a member of the local Reno/Sparks/Tahoe MLS (Multiple Listing Service). This will give your property much greater exposure in the market place. This system provides a means of networking with other local Reno Real Estate, Sparks Real Estate and Tahoe Real Estate companies. What this means is, when you list with a real estate company that is a member of the MLS, all agents within the local and participating MLS Boards are able to access your Reno homes, Sparks Homes and Tahoe Homes information and can potentially show your property. Does your Reno Realtor offer VIRTUAL TOURS? Virtual tours are an excellent tool that your Reno Realtor can use to showcase your property. Potential buyers can preview your property without having to make an appointment with a Reno Realtor first. This saves you valuable time, plus it exposes your property to more educated and interested buyers! Once you’ve decided on a Reno Real Estate company, you will meet with an agent who will then do a CMA (Comparative Market Analysis) on your home or property. The agent will research other similar properties in the area that have sold or are currently up for sale. This may include homes of similar size, age, condition, land size that have sold within the past 6 months. Deciding what price to list your property at in the beginning is VERY important. Overpricing can work against you in the end. After you decide on a fair price for your property, it’s time to go through the paperwork required to list your property. Be sure to check out our marketing strategy and tips for staging your home for potential buyers. The listing agreement usually consists of two pages. This may vary depending on the Reno Real Estate company. In the contract you and the Reno Real Estate company will agree in writing, the listing price, the length of the contract, what items might be included with the sale, commission percentage or flat fee and any other conditions that may be agreed upon. 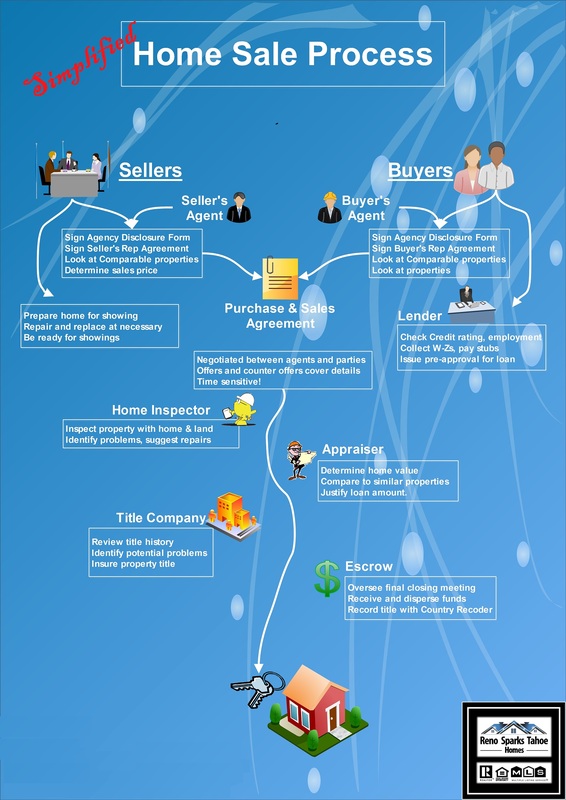 The sellers disclosure is a form that has to be provided to every buyer before completing the purchase of any Reno homes, Sparks Homes, or Tahoe Homes. The law in the Reno Real Estate Market is that the seller must provide this information. When filling out a sellers disclosure, it must be filled out by the owner to the best of their knowledge, without the aid of the Reno Real Estate agent. There will be questions on the form asking what items work or don’t work (if included in the sale), well and septic information, insulation, roof age, if there are any easements or encroachments, farms in the area, etc. The lead based paint disclosure is another form that is required by the Reno Real Estate, Sparks Real Estate and Tahoe Real Estate Markets to be filled out and provided to the buyers prior to purchasing a home. Homes built prior to 1978 could possibly contain lead based paints. The form simply asked the seller if they have any knowledge of any lead based paint being present in the home. The agency disclosure is another required form in the Reno Real Estate, Tahoe Real Estate and Sparks Real Estate markets. This form simply clarifies which party the real estate agent/company is representing in the sale of a property. Once all of the necessary documents are signed and completed, the first step is placing a “For Sale” sign on the property. This is very important! Some people might opt not to have a sign placed on their property because they’d rather not have the neighbors know that it’s up for sale. If your are truly serious about selling your Reno homes, Sparks homes or Tahoe Homes, you will want to have a sign visible. You may miss out on a potential buyer simply because they never knew your property was for sale because they didn’t check with a Reno Real Estate agent first. After a sign is placed on the property, the Reno Realtor will get your property information submitted into the Reno MLS, Sparks MLS or Tahoe MLS. This will give all other participating real estate companies access to your property’s information. If you’re new to real estate, the negotiating process may seem arcane. However, it’s actually well thought out and when handled correctly, is effective and protects both buyer and seller. Negotiation begins when the buyer makes a written offer. An earnest money deposit should accompany the offer, demonstrating that the buyer is serious. You can accept the offer exactly as proposed. If you do, you’ve just sold your home! Or, you can reject the offer outright, in which case your home is still for sale. It’s important to understand that, contrary to what most sellers would like to do, you cannot both accept and counter an offer. A Counteroffer is your offer back to the buyer. Usually, but not always, it’s for a compromise price somewhere in between what you were originally asking and what the buyer originally offered. Or, it could be for the buyer’s price, but terms different than what the buyer offered. When you reject the buyer’s original offer and make a Counteroffer, it’s very important to understand that you may be tossing away a potential deal. The buyer is under no obligation to accept your Counteroffer. Rather, he or she can simply walk away with the deposit and no regrets or penalties. You should not counter a buyer’s offer unless you are prepared to lose the deal. Your Counteroffer is open to the same possibilities from the buyer’s side as the buyer’s original offer was open to you. The buyer can accept, reject or counter your counter. The same rules apply. The buyer cannot both accept and counter your Counteroffer. This protects you from having a buyer accept what you’ve offered and then, for example, add a clause lowering the price. The buyer’s new Counteroffer is a brand new offer to you. This countering can go back and forth many times until either agreement is reached, or no agreement is possible and both parties simply back away from the deal. At any time, you can withdraw a Counteroffer, providing you haven’t been informed that the buyer has signed it. The same rule holds true for the buyer – he or she can withdraw any offer made prior to communication of your acceptance. Although the process may seem confusing, actually it works quite well, particularly when it is well-oiled by the competent back-and-forth help of real estate professionals. Should I Accept The Buyer’s Offer…Or Counter? Before making this important decision, you should consult with your agent and, perhaps, with your attorney. The wrong move could cost you money… or lose the deal. How desperate are you to sell? If you must sell, then you simply may not be willing to risk a counteroffer. How bad is the offer? Many times buyers will “low-ball” or come in at a very low price. You don’t know for sure, but they may very well be expecting you to counter higher. Not doing so might mean you’re agreeing to sell for too little. How strong is the market? If you lose this buyer and this deal, is the market sufficiently strong that another buyer/deal will likely soon come along? Can you live with the terms? The buyers may have inserted a contingency that makes the sale improbable. For example, they may be insisting that your sale be contingent upon them selling their existing house. If their old house doesn’t sell, they aren’t committed to buying your house. In a strong market with lots of buyers, you might want to counter by removing this contingency or by giving a short time limit for them to sell their old home. An agent can be very helpful in explaining your options to you as well as framing the various counteroffers you might want to make. Until there is complete agreement, the deposit belongs to the buyer. The moment both buyer and seller agree on price and terms, however, the deposit belongs to you, the seller. In actual practice, however, buyers are loath to give sellers the deposit. The reason is that if for some reason (not the fault of the buyer) the deal is not completed, it could be difficult getting the deposit back from the seller. A recalcitrant seller might simply refuse to give it back, or worse, spend it and not have it to give back! All purchase contingencies must be removed. This usually includes having the buyers approve a disclosure statement you provide, approve an inspection report they order (and pay for) as well as having them remove any other contingency they have holding up the sale. Property title must be cleared. That means you may need to remove any liens or encumbrances (such as judgments that may have arisen from a failure to pay a debt) or other items that “cloud” or restrict your title. There must be inspection clearance. Required in most sales involving a mortgage, this means you will need to order an inspection, do any required repairs or treatment and get the written clearance to escrow. Any prearranged work must be finished. This includes such things as repairing a roof or repainting a portion of the home. All work agreed upon between you and the buyer must be completed. All ends must be tied. Any other task required to close escrow must be accomplished. It’s important to have someone in charge, tracking all of the things that need to be done and seeing they are accomplished in a timely fashion. You can do this, or your real estate agent can do it for you. The escrow officer cannot normally be relied upon to do all of this work. If no one keeps track, something critical may not get done in a timely fashion and the deal could fall through. It’s rare that closing an escrow will have no problems at all. You can almost always count on at least a few things cropping up. What’s important is that you learn about the problem as soon as possible and then take appropriate steps to correct it. For example, some repair work that you need to do involves removing moldy flooring in a bathroom. You have the work started immediately. Later it’s discovered that the damage is more extensive than originally thought and it will take longer than anticipated to complete. Because you started early, you still have time to finish it and close escrow by the agreed upon date. If you had waited, things might not have turned out as well. Moving quickly is the key to successful closings. Additionally, you will want to carefully track the buyer’s attempts to get financing. If the buyer cannot get a needed mortgage, the deal probably cannot be completed. You want to learn about a buyer’s difficulty in getting financing early on, so you can take steps to get your home back on the market as quickly as possible. Selling to a buyer who has been “pre-approved” by an institutional lender helps to avoid this problem. It’s important to understand what legal responsibilities your Reno Real Estate, Sparks Real Estate or Tahoe Real Estate salesperson has to you and to other parties in the transactions. Ask your salesperson to explain what type of agency relationship you have with him or her and with the brokerage company. Seller’s representative (also known as a listing agent or seller’s agent). A seller’s agent is hired by and represents the seller. All fiduciary duties are owed to the seller. The agency relationship usually is created by a listing contract. Buyer’s representative (also known as a buyer’s agent). A real estate licensee who is hired by prospective buyers to represent them in a real estate transaction. The buyer’s rep works in the buyer’s best interest throughout the transaction and owes fiduciary duties to the buyer. The buyer can pay the licensee directly through a negotiated fee, or the buyer’s rep may be paid by the seller or by a commission split with the listing broker. Disclosed dual agent. Dual agency is a relationship in which the brokerage firm represents both the buyer and the seller in the same real estate transaction. Dual agency relationships do not carry with them all of the traditional fiduciary duties to the clients. Instead, dual agents owe limited fiduciary duties. Because of the potential for conflicts of interest in a dual-agency relationship, it’s vital that all parties give their informed consent. In many states, this consent must be in writing. Disclosed dual agency, in which both the buyer and the seller are told that the agent is representing both of them, is legal in most states.